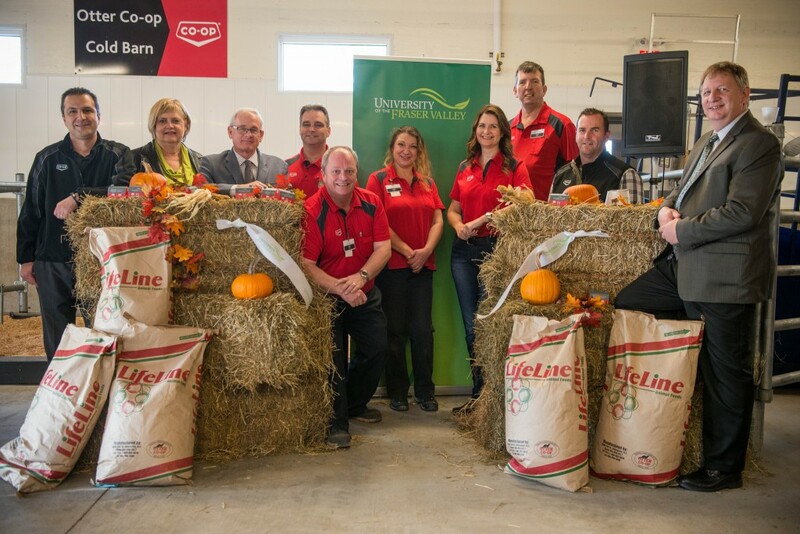 Otter Co-op representatives visited UFV on Oct 27 to open the Otter Co-op Cold Barn. They were welcomed by Dean of Applied and Technical Studies John English and Garry Fehr, Director, UFV Agriculture Centre of Excellence. CHILLIWACK – UFV agriculture students and faculty gathered recently to thank Otter Co-op for supporting their Agricultural programs through a $75,000 donation of funds and gifts-in-kind. The funding provided by Otter Co-op helped to build and outfit barn facilities in the UFV Agriculture Centre of Excellence (ACE) on the UFV Chilliwack campus. UFV has named the Otter Co-op Cold Barn in recognition of the donation. Garry Fehr, the director of the UFV Agriculture Centre of Excellence, thanked the Otter Co-op representatives for supporting local agricultural education at the Oct 27 event. Otter Co-op general manager Jack Nicholson said that as a co-operative, his organization’s values include investing in the community and supporting sustainable initiatives. 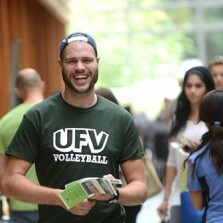 “Supporting UFV’s Agriculture programs is right in line with our values,” he said. Otter Co-op’s support of UFV Agriculture includes a cash donation towards capital costs of outfitting the new barn facility at the Agriculture Centre of Excellence, and “in kind” donations of feed, fuel, and other supplies to support the livestock program. After the formal launch, there was lunch. Otter Co-op treated students, UFV representatives, and valued co-op customers to a barbecue lunch at the UFV Agriculture Centre of Excellence. Visitors the the centre also got tours. Based in Aldergrove, Otter Co-op is a cooperative with several retail centres, a feed store, two bulk petroleum outlets, nine gas stations, and other associated businesses. Its customer base is largely drawn from the agricultural community, but anyone is welcome to become a member. UFV Agriculture department offers several agriculture credentials in the livestock and horticulture. The new Agriculture Centre of Excellence (ACE) is a research hub for agriculture, bringing together and sharing expertise from UFV, the agriculture sector, and industry stakeholders. The ACE takes a multidisciplinary approach to agriculture, encouraging research and program development from a number of UFV departments. The areas of focus for the Agriculture Centre of Excellence include agribusiness and technology; food ingredients and value-added foods; sustainable production practices; skilled labour development and industry change; and rural entrepreneurship and agritourism.